Ted’s brother, Tyler, is the Pittsburgh Pirates No. 17 overall prospect and is one of the Single-A South Atlantic League’s best pitchers. Ted Glasnow laughs about his misfortune. The Hart High graduate and University of Notre Dame decathlete and heptathlete had Tommy John surgery after his freshman year. Tommy John surgery is the elbow ligament replacement procedure named after the former Major League pitcher and attached to baseball. Better it happened to him. “There’s more money at stake for him,” Ted says of his brother — Hart High graduate and Pittsburgh Pirates pitching prospect Tyler Glasnow. That’s true, however Ted has his own set of accomplishments and future. Together, they make up a unique athletic brother tandem — one that rivals the Vereen brothers in football and Valaikas in baseball as the most accomplished and promising active duo from the Santa Clarita Valley. The Glasnows are unique, though. Ted, a former track and field athlete and football player at Hart has blossomed into a collegiate champion at Notre Dame in a track and field event that is non-existent in local high school competition — the hepthathlon. The 22-year-old, 2009 Hart grad is also a top Big East competitor in the decathlon. Tyler, a former two-year varsity baseball pitcher at Hart, has blossomed into the Pirates’ No. 17 overall prospect and one of the Single-A South-Atlantic League’s best pitchers. In high school, both athletes weren’t widely celebrated as being top names in their respective sports. But since high school, they’ve taken off. To get a sense of Tyler’s success, Ted says his family has watched Pirates games on TV throughout the season and on three occasions the commentators have made mention of the right-hander’s successful starts. 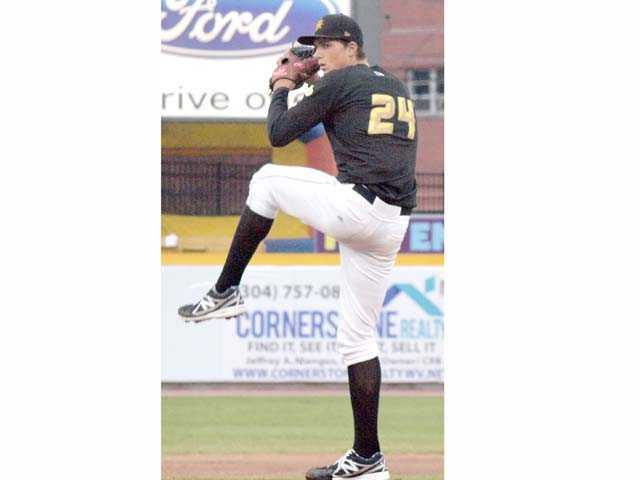 After six shutout innings on Tuesday, Tyler, a 19-year-old, 2011 Hart graduate, is 7-2 with a 2.27 ERA, having struck out 122 batters in 87 1/3 innings for the West Virginia Power. Through 31 career professional games he has a 2.15 ERA. When he was a senior at Hart, head coach Jim Ozella talked about how raw he was and how he was just going to get better and better. He was 5 feet, 7 inches tall his freshman year. When he left Hart, he was 6 feet, 7 inches tall and 195 pounds. Between that time, he had some uncertainty. Tyler’s mother Donna says she still has letters that her son wrote in elementary and junior high school saying how he wanted to be a professional baseball player. Tyler says that didn’t become a real serious thought until he had a pitching lesson in high school with local pitching guru Jim Wagner — who’s known for his work with Hart grad and top baseball prospect Trevor Bauer. Tyler was throwing a consistent 79 mph, 82 on a good day. Wagner had him take three weeks off from throwing and gave him some arm exercises and the next time the pair met up, Tyler hit 87 on the radar gun. He credits a lot of others for his ascent as well — the Pirates coaching staff for their patience and teaching, his parents Donna and Greg for their support and work ethic (Donna was a gymnast and head gymnastics coach at Cal State Northridge and Greg owned his first business at 19) and Ted. It’s a work ethic clearly recognized at Notre Dame. Ted says it was Garnham who gambled on him by offering him a spot on the track and field team. The Glasnows sent out a track and field highlight video to multiple colleges. Notre Dame was a dream school. Both Ted and Tyler visited the campus when they were preteens and watched a football game at Notre Dame Stadium. “He was a high jumper in high school. He hadn’t done the decathlon. He was new to it. I guess it was kind of a gamble,” Garnham says. But he says he saw a kid with good size and athleticism and the intangibles to compete the 10 track and field event sport of decathlon. He also had an outgoing All-Big East decathlete and heptathlete that he could pair Ted with to learn from. There were growing pains, including the Tommy John surgery, which Ted says is a result of his lack of familiarity with throwing the javelin. But in February, he won the seven-event heptathlon at the Big East Indoor Track and Field Championships. Yet to this minute, he is still bitter about a third-place finish in the decathlon at the Big East Indoor Track and Field Championships in May. It’s fuel for his final season at Notre Dame in 2013-14. The Big East Academic All-Star’s expectations for the coming year are high. The same could be said about Tyler. And the brothers are big fans of each other.